The first class of students from the Long Beach Career Partnership Academy - Healthcare celebrated graduation as Certified Nursing Assistants last month. Eleven graduates of Cabrillo, Jordan and Poly High schools spent 18 months combining academic knowledge with workplace readiness skills and technical procedures to earn their licenses. As of one week past their graduation, the class boasted a 100 percent employment rate within the health and medical fields in the Greater Long Beach area. “This accomplishment indicates student commitment to a vibrant career in the healthcare industry, and each is to be commended for their skill and determination in achieving this initial step to economic self-sufficiency," said Ben Espitia, Director of Workforce Development at Goodwill SOLAC. 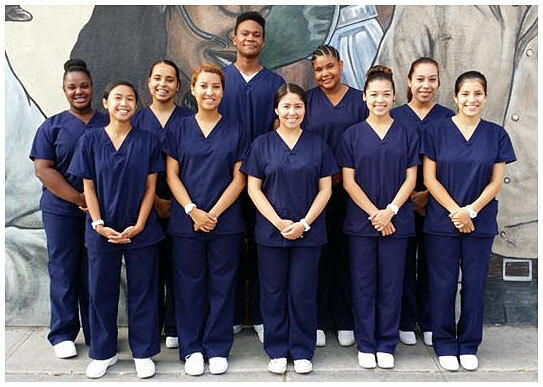 The Long Beach Career Partnership Academy - Healthcare is a workplace learning program resulting from collaboration among the Long Beach Unified School District, Goodwill SOLAC, and businessman Damon Dunn.